Any meal is better outside on the deck. Our favorite thing is to enjoy afternoon happy hour cocktails while soaking up the sunshine followed by grilled pizzas. We have enough kitchen equipment to comfortably cook for 10 including major holiday meals. We also have some common pantry items and condiments. Entertainment system includes Netflix, HuluPlus, & Pandora. Fold out couches for family movies. We also have games, legos, toys, and books for the kids. There are two queen bedrooms and one bunkbed room all with supportive memory foam mattresses, luxurious down duvets, and premium linens. How do you prefer your s'mores; classic? With Nutella? With Peanut Butter? Whichever way, you will enjoy the conversation around the campfire. 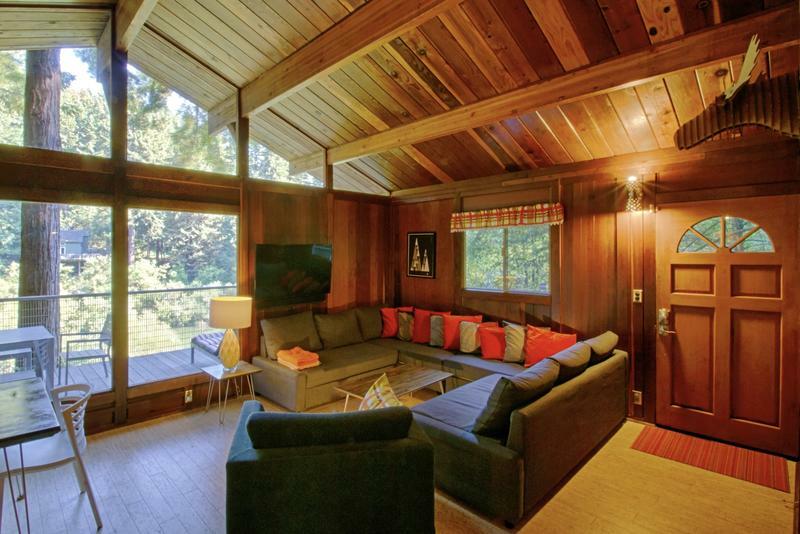 A Mid-Century Gem in the Redwoods—Bring the Kids! Think traveling with kids means sacrificing gorgeous, architecturally inspiring accommodations? A true mid-century modern gem, Lucky Bend Lookout was architect-designed and constructed in 1966, and is kid-friendly down to the childproofed details. It’s environmentally friendly, too—during a recent remodel, we took care to increase thermal performance by 400 percent (that includes heated floors!) and used only sustainable building materials and native plants. Protecting nature—which is so gorgeously on display here—is a priority for us. 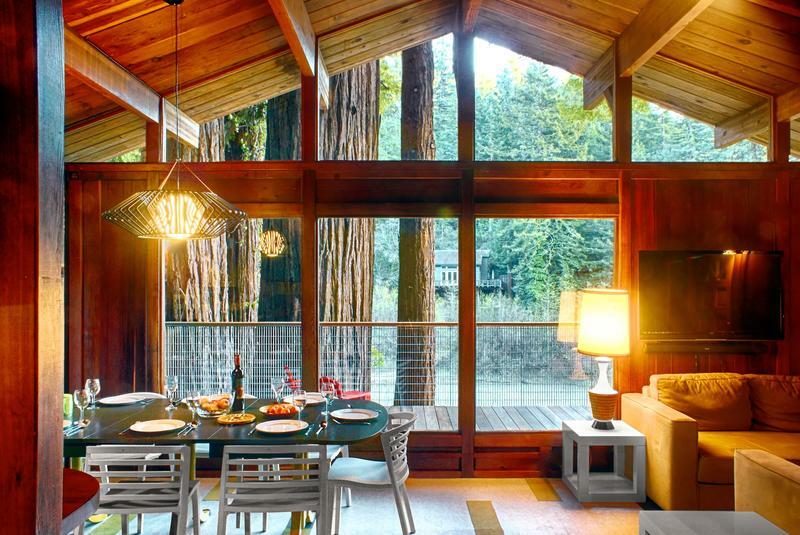 In true mid-century modern tradition, the Lucky Bend Lookout’s open floor plan, elevated treehouse-style deck, enormous windows, and warm redwood walls and ceilings merge indoor and outdoor spaces. Have you ever vacationed somewhere that’s brimming with natural beauty and felt guilty for just wanting to relax inside with a good book? Here, that’s no dilemma. Watch ospreys soar among the redwoods from the couch in the living area, decorated with clean lines and whimsical fabrics. Or sauté fresh vegetables from the Guerneville Farmers Market in our fully stocked kitchen as you watch your kids play outside on the deck. Then, present your handiwork to your hungry family at the sleek dining table—which has room for 10—and watch the Russian River drifting by in the fading light of evening while the adults sip our region’s famous wines. Or you can get even closer to nature and feast at the eight-person outdoor dining table on the spacious deck among the trees. Or plan on an epic day of activity and reward yourself with our private chef who will prepare a gourmet meal right to your tastes right there are Luck Bend Lookout and sweep away all the dishes and cleanup afterwards while you relax on the deck in the warm breeze. After dinner, get cozy in the living room and watch the stars reflect their sparkle on the river as you browse Netflix, HuluPlus, or Pandora Radio on our 47-inch flat screen TV. The couch doubles as a pull-out bed. For the kids, we keep our cabin clear of breakable knickknacks and stocked with all the gear you need. A Pack ‘n Play, high chair, step stool, potty-chair, toddler bed rail, high chair, and stroller keep the little ones safe. Plus, we supply a few extra goodies to keep them happy, like a water table, a swing set under the deck, and some inside toys. One bedroom features a play tent and a sturdy set of bunk beds for a fun, summer-camp setup, except much comfier—we use memory foam mattresses on all of our beds. 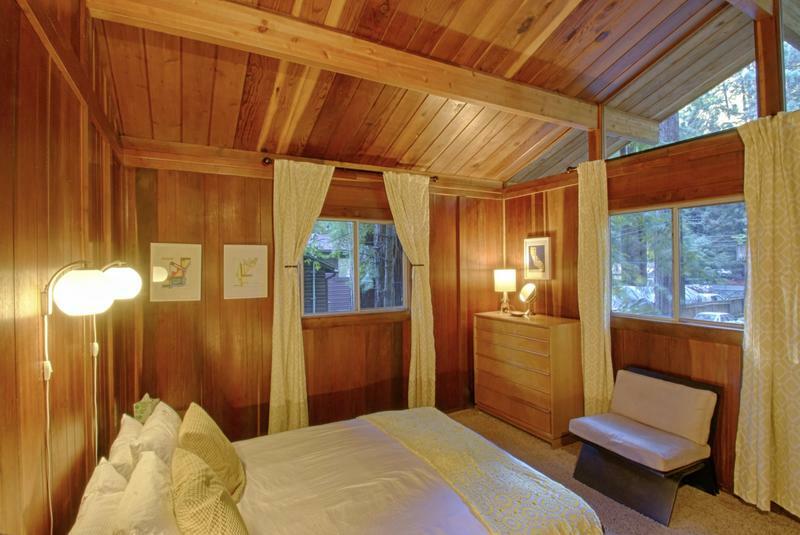 And your kids’ imaginations will run wild with the magical redwood grove in view just outside their window. Two adult bedrooms, with queen-sized beds and mid-century modern details like shag carpeting and low-profile beds, invite you to sink in for the night. 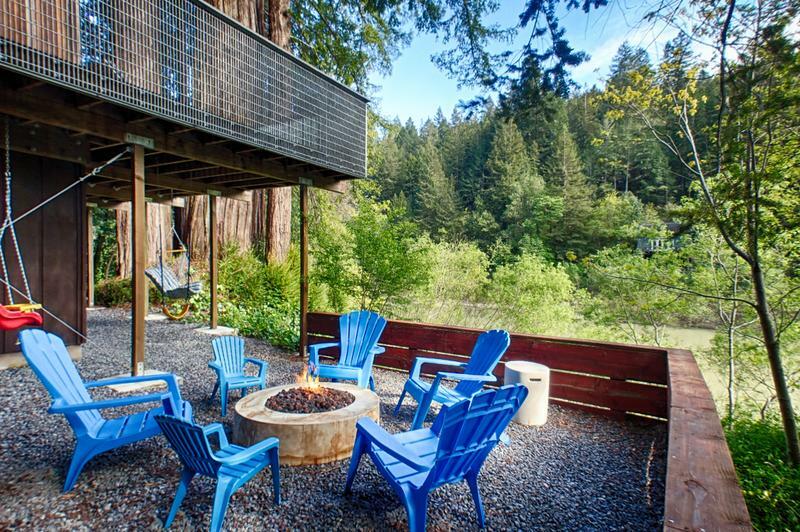 A view of the redwoods will greet you in the morning. Our home is a dream for families who love the river life with a floating dock, along with stairs that lead directly to the river. The water will literally be steps away! 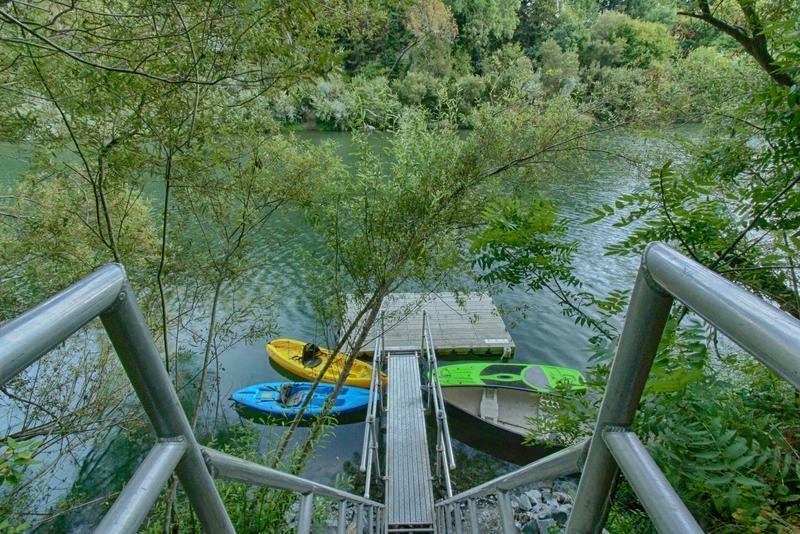 As our guest, you’ll also enjoy complimentary use of our two kayaks, SUP, and canoe. The dock is not guaranteed to be available on a set date. It is usually in the water approximately from Mid-June through September which is when the seasonal dams are added to the river. 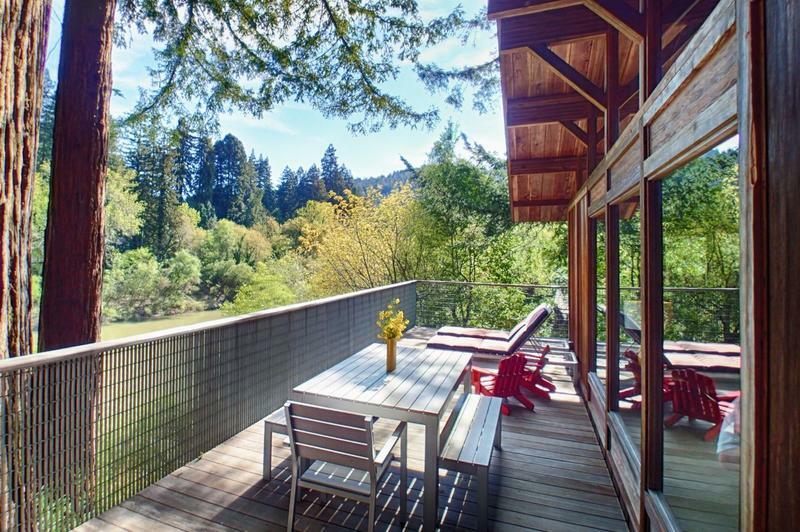 Downtown Guerneville is only a mile from the Lucky Bend Lookout. We are located 10 minutes by car from the nearest winery and 15 to 20 minutes from dozens more. There are even kid-friendly wineries in the area! A sandy beach along the Russian River is a 10-minute walk from the property, or hop in the car and head 20 minutes to the Sonoma Coast to surf, explore tide pools, and spot harbor seals sunning themselves. Lucky Bend Lookout comes with beach chairs, an umbrella, beach toys, a cooler, and a cruiser bike. 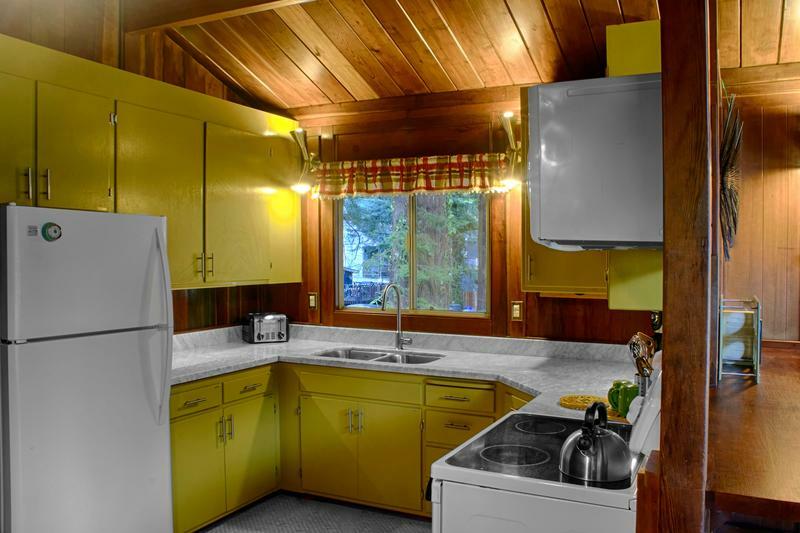 Our calendar fills fast—the time to book your mid-century modern oasis is today! Sonoma County TOT Certificate #1082N. We have exterior security cameras.